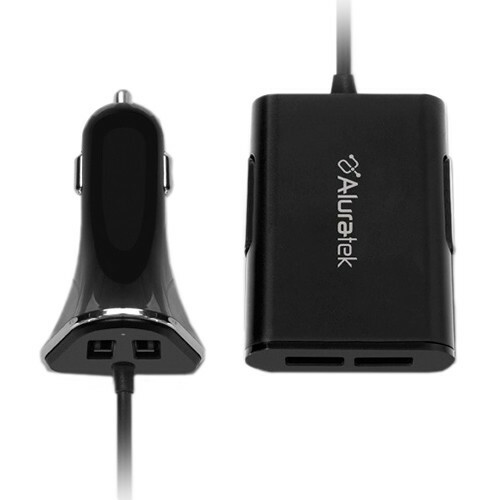 Charge multiple devices while you're on the go with the 4-Port USB Car Charger from Aluratek. This charger plugs into your vehicle's lighter port and supports most USB-compatible electronics, including smartphones, tablets, gaming devices, and more. Each of the charger's four USB ports outputs up to 2.4A of power, so you can recharge all your devices quickly and conveniently. When not in use, the charger's sleek and small design makes it easy to store anywhere in your vehicle. Box Dimensions (LxWxH) 6.4 x 4.9 x 1.9"